Amun has been running away quite happily in my lab since initial install. From a statistic perspective my wor has been made really easy as Miguel Cabrerizo has previously taken one of the InfoSanity statistic scripts written for Nepenthes and Dionaea and adapted it to parse Amun’s submission.log files. Results generated from the script in my environment are below, if you’re wanting to get an overview of submissions from another Amun sensor the script has been uploaded alongside the other InfoSanity resources and is available here. A comment on a recent post asked for a comparison between different honeypots, while this is far from conclusive and only focuses on a single aspect of the technologies one of InfoSanity’s Nepenthes sensors ‘saw’ more attacks in the last 24hrs than my Amun installation did in the almost three weeks shown above. As both are running within the same, small, IP allocation I think I’m safe in assuming that one IP isn’t actually receiving a disproportionate level of interest from the badguys and bots that are out there. 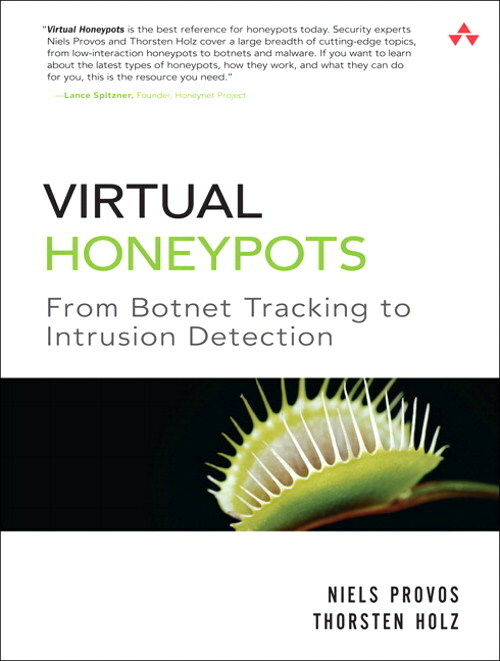 It took longer than I had wanted, but I have just finished reading through Virtual Honeypots: From Botnet Tracking to Intrusion Detection. The book is written by Niels Provos, creator of HoneyD (among other things) and Thorsten Holz. Given the authors I had high expectation when the delivery came through, thankfully it didn’t disappoint. Unsurprisingly the first chapter provides an overview of honypotting in general, covering high and low interaction systems over both physical and virtual systems, additionally the chapter introduces some core tools for your toolkit. The next two chapters cover both high and low interaction honeypots respectively. I really liked the coverage of hi-int honeypots, it was this idea that drew me towards honeypots in the first place the idea of watching an attacker carefully exploit and utilise a dummy system always appealed. The material provided gives a great foundation for starting with a high interaction honeypot and some best practice advice for how to do so securely and safely. While I have read many reports and case studies that involved honeypots I have had difficulty finding in depth setup information and advice, leaving high interaction honeypots feeling a bit like black magic. The author’s information cuts through all the mystery allowing the reader to get a firm understanding of the topic. Likewise the discussion of low-interaction honeypots was equally well covered, although as I’ve spent some time with low-int systems in the past this chapter was more of a refresher than providing unknown information as I had found with the hi-int section. Given that Neils is one of the books authors, it shouldn’t be too much of a surprise that HoneyD is covered in depth. For me, this was the most useful section of the book. As honeyd is one of the older publicly available low-int systems I had mistakenly assumed that one of the newer systems would provide more functionality, after reading through the material and regularly going ‘ooh’ out loud honeyd is now firmly at the top of my ‘need to implement’ list. The book also covers honeypot systems that are designed for specialised purposes. For malware collection, the authors mainly focus on Nepenthes, but also touch on Honeytrap among others. This was the only section that I found to be slightly dated, as the Nepenthes’ newly released sprirtual successor Dionaea was not covered. But as the fundamental material is very well explained, Nepenthes is still a very functional system and the inherent similarities between Nepenthes and Dionaea the material still useful regardless so the chapter still provides an excellent foundation if you’re wanting to start collecting malware. The last chapter covering honeypot systems looks at client-side honeypots, designed to look for client-side attacks. As client-side attacks have become more prominent over the last few years this is an evolving area of research, but as the attack vector is newer than traditional attacks, the honeypot systems aren’t as mature as more traditional systems. This isn’t an area that I’m experienced with so I can’t comment too much on the systems detailed by the authors, but they cover several honeyclient systems in great detail, and I’m intending to use the chapter as a foundation for implementing the systems and techniques proposed. As well as detailing the use of honeypot systems, the authors also provide a brilliant discussion of ways that attackers (or users) can determine that they are interacting with a honeypot system. While the detailed descriptions for ways to identify a honeypot system is interesting and important from a theoretical standpoint, from previous experience running honeypot systems there are more than enough attackers and automated threats that blindly assume the system is legitimate to still enable honeypots to provide plenty of benefit to the honeypot administrators. The book finishes up with an fairly detailed discussion of both tracking botnets using the information gathered from honeypot systems (this chapter is available as a sample PDF download from thanks to InformIT, here) and analysing the malware sample reports provided by CWSandbox. While both chapters are useful in he context of honeypot systems I didn’t think there was enough room to provide the reader with anything beyond a general overview of the topics, which if you were interested in the topic enough to purchase the book, then the reader will likely already have a similar level of understanding to the information provided. There is also a chapter covering case studies of actual incidents that were captured by the books authors during their research. I’ve always been a fan of case studies, so enjoyed this chapter, it definitely helps whet the appetite to implement the technologies covered by the book. Overall I really enjoyed the book, if you’re interested in systems and network monitoring, honeypots or malware then this book should probably be on your bookshelf.